Wild caught salmon is well known for being a great source of easily digestible proteins and fatty acids like Omega-3 in the form of triglyceride, as well as vitamins like vitamin-D, vitamin-A, and some members of the vitamin-B family. Bonus: It also contains minerals like selenium, zinc, phosphorus, calcium, and iron. With all of those health benefits, it’s a no brainer on what to make for dinner this week. In a small bowl, combine first 5 ingredients (olive oil through garlic). Add sea salt and freshly ground black pepper to taste. 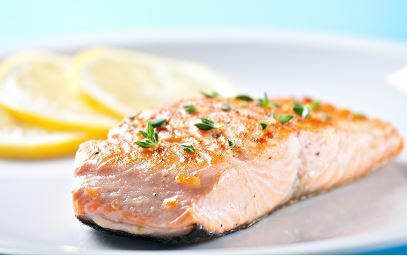 On a large rimmed baking sheet lined with parchment paper, place salmon fillets. Evenly coat the top of each piece with the oil mixture. Place pan in oven on the top rack and bake for 10 to 12 minutes, or until salmon is cooked through and flakes easily with a fork. Drizzle salmon and broccolini with ume plum vinegar. Serve warm with black rice for even more polyphenols, and steamed broccolini.